Or Horner's comments that him, Contador, and Schleck were the only better climbers then him. Oh how I miss Alberto and Andy. 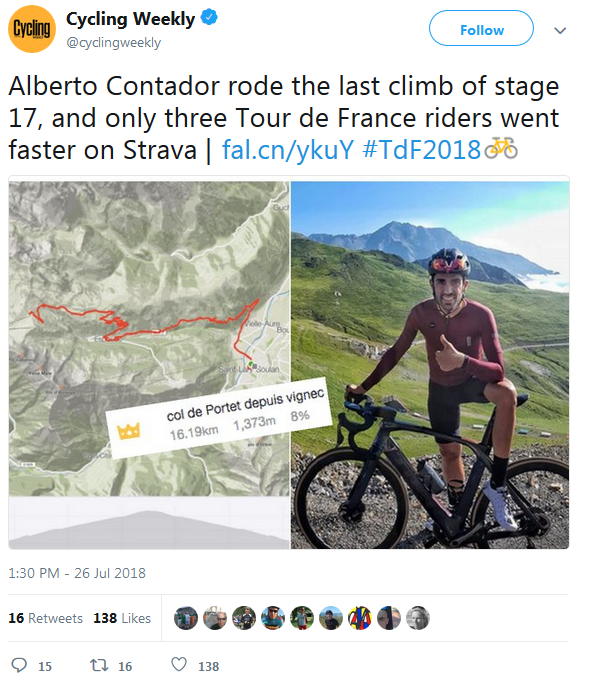 Hypothetical Peak Contador is the destroyer of worlds. Saddening to find this on page 3. And I'm unable to understand a word But he looks Good and Happy! Lordy if there was ever a Berto stage, it would be today. Go from the flag and never look back! He is Sorely Missed! Yeah wish there were subtitles. "Contador climbed Col de Portet in 56:00 today. VAM 1500 m/h. Not bad. That's going to be faster than climbing times of 120 TDF riders. #TDF2018"
LaFlorecita wrote: "Contador climbed Col de Portet in 56:00 today. VAM 1500 m/h. Not bad. That's going to be faster than climbing times of 120 TDF riders. #TDF2018"
If Contador did the climb in 56 minutes, that's about 5.2W/kg. Quintana was at about 5.85 W/kg, and there were twenty riders within six minutes of him. Though a few started the climb ahead of Quintana, most were in the MJ group. Without being disrespectful, is this not surprising seeing he didn't have another 16 days and 2 previous mountains in his legs? He is quite fresh and seemed to glide up that climb with Flecha breathing like me on the flat! Merckx index wrote: If Contador did the climb in 56 minutes, that's about 5.2W/kg. Quintana was at about 5.85 W/kg, and there were twenty riders within six minutes of him. Though a few started the climb ahead of Quintana, most were in the MJ group. context as usual, how many tour days has bertie done this year??????? How much training he's done is the more interesting question. It's the 3rd week yes, but climbing performances in the 3rd week can often be some of the best.